First, men — middle-class white men, to be specific — are far more likely to have been given access to a computer and encouraged to use it at a young age. I love that you learned BASIC at age ten. But please realize that this has not been the case for all of us. Second, the “culture of code,” the inside jokes and joshing that you enjoy, may not be equally appealing to everyone who encounters it. This should be, but apparently isn’t, obvious. But Miriam, you’re thinking, there are lots of examples of DH coders who started late and are now well-respected and proficient! This is true! And they inspire me all the time. But this is also why I wanted to talk a little bit about what it’s like for a woman to learn to program. Should you choose to learn in a group setting, you will immediately be conspicuous. It might be hard to see why this is a problem; after all, everyone wants more women in programming. Surely people are glad you’re there. Well, that’s true, as far as it goes. But it also makes you extremely conscious of your mistakes, confusion, and skill level. You are there as a representative of every woman. If you mess up or need extra clarification, it’s because you really shouldn’t — you suspected this anyway — you shouldn’t be there in the first place. I have sat through entire workshops that were clearly pitched beyond my skill level because I just didn’t want to make us look bad. It’s more awkward when you break for lunch, because where are you supposed to sit? It’s uncomfortable. I am not known for being shy, and let me tell you: It is awkward. But there are all these online communities where you can learn to code. There are! But if you are under the impression that online communities are any friendlier to women’s participation, then you, my friend, have not looked lately at Wikipedia. Well, just practice! I did the work — so should you! Here is the real point I’m trying to make here: It is not about “should.” What women should do has nothing to do with it. The point is, women aren’t. And neither, for that matter, are people of color. And unless you believe (and you don’t, do you?) that some biological explanation prevents us from excelling at programming, then you must see that there is a structural problem. So I am saying to you: If you want women and people of color in your community, if it is important to you to have a diverse discipline, you need to do something besides exhort us to code. Just want to say that this problem exists somewhat in libraries, particularly in digital library areas, but interestingly, there are plenty of library IT workers who are women. I think its possible that the predominance of women in libraries led many of them to develop tech skills as part of their jobs. The other interesting thing I notice about libraries is that many librarians, male and female, are people who love structure, order and breaking down problems. Most library technical services work is very data and data structures oriented. It may also be somewhat interesting to contrast the issues in DH and other parts of higher ed IT. Is this an issue in other areas, such as IT for languages, museums, etc? I appreciated the comment above about student jobs at helpdesks and in labs leading to much bigger things. All I can say is speak for yourself. These are your issues and not the entire womenkind. Don’t you think that by writing posts like this that you are doing women a disservice? 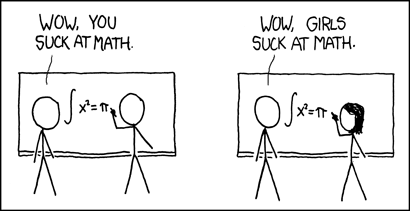 You may find it difficult to believe but there are some women(of which I am one) that love Maths, got A in school at it and therefore are not frightened by analytics, coding or anything that requires a particular form of logical thought process. Are you saying that the teaching of coding or building software should now be dumbed down because you don’t understand or aren’t proficient at it? I’m getting bored of women blaming others for not being able to penetrate the boardroom or become the next Mark Zuckerberg. If you want it badly enough, then you will compete and find a way instead of constantly whining and berating others to make exceptions for you. The assumption is that women at a computer are spending idle time, while men at a computer are involved in serious business. I am also learning to code, but I am wondering, as I learn, will these coders turn around and try to earn a Ph.D. in literature? Why is my work devalued? If you don’t have at least one 2000-page text book that you’ve re-read more than 5 times in the last ten years without feeling that you have come close to mastering it, you won’t appreciate the fact that “coding” is more than a gimmicky skill you can pick up by doing Codeacademy exercises in between some “real” classwork, only so you can put it on your resume. If you know what it takes to become fluent in a foreign language, you get the idea. Formal languages are still languages, and becoming good at them takes just as much of a commitment. will suddenly seem far more welcoming! I agree that its not fair for minority women who come from a culture, where you have to be submissive and have a “girl job”. I was raised in a home that praised males because they are seen as the providers.. and as a girl u shouldn’t waste your time on the computer. mindset, a little dedication, and finding the right support structure. Any woman who’s looking for a community to learn coding with, there are inevitably going to be online bullies: shun them, and shun any communities which allow them to participate. In most communities, though, you’ll also find people who’re kind of abrasive, not very good with the social skills, and who seem to keep insisting that you ‘Read the FAQs’. I’ve been one of these people. They’re not as bad as they seem. Most communities have a basic kind of culture: it’s not designed to keep outsiders out, but to keep the members from having to explain things over and over again to newcomers. But if you’re seeing a culture filled with weird in-jokes and ‘snarkasm’, it’s a good sign that this isn’t going to be a good learning community. Painting all communities with the same broad strokes isn’t going to help anyone. There are good communities out there, just keep looking and asking questions. I’m unclear on what we can do, as a whole, to support women trying to learn to code. Set up women-only forums? Market some forums as being women-friendly? Ultimately, aren’t your best resources the individual people who help you? You’ll find these people in a lot of communities. Some of them are incredibly helpful. Use them as much as possible. I’m just hoping that today’s kids, with their access to ubiquitous computing devices, grow up with equal opportunities for coding. In fact there are people out there who’re trying to make this happen: check out CoderDojo (I don’t have a link handy, but it should be the first result on Google). I understand the frustration you may be feeling, however, I was a computer consultant for over 20 years, worked alongside more men than women — sometimes I was the only woman — and never felt out-of-place. I was respected and loved my work. I still code, but my professional goals evolved over time. I thank the iSchool at Syracuse University and the very forward looking dean at the time, Robert Taylor, for encouraging me to enter the field. It was the best thing I ever did. And I still use the habits of mind developed over the many years I spent analyzing complex tasks to tackle very different problems. We only close doors on ourselves. Miriam, if one wants to learn programming to enable them to do their job better, great. “Everyone needs to learn to code in order to keep up with digital technology or do their job” is a Rushkoff type of mentality, which I don’t agree with. If one can’t do one’s job efficiently because one can’t code, then maybe one should get another job. If we don’t have the aptitude for a particular thing it’s because that’s that extent of our limitations or desires, not because of our gender. Maybe I don’t feel like coding. But that’s because I don’t feel like it, not because of my gender, or I have something to prove to someone else. With the feminist movement alive and well today, I’m surprised to find this type of gender play being publicized. But it’s out there I see. Hi! Coming in LATE to the conversation haha. This post illuminated a lot of good points of the imbalance in coding education. I wonder how, then, we can approach DIY coding educational tools and organizations like Codeacademy. It’s a kind of an isolated pedagogic tool. Kind of ironic that in order to giving marginalized people the tools they need to get into the discourse, we have to enact a very neoliberalized model of learning. The rise of DIY programming is cool, but are these tools just deferring the question of where women and POC voices are actually heard in coding’s development as a language?